99% of my meetings are held in cafes & restaurants all over London. Mostly people are adventurous & like trying little independent places, but every now & then you find yourself a Starbucks addict. I don’t mind Starbucks. They have big comfy chairs & free wifi… but the food? Half filled paninis, dried out old brownies, fatty muffins, no thanks. “Mmmm” I mumbled, not wanting to be rude…. then changed my mind. I disagreed and told her she needed to try real lemon cake. I promised to make her one for our next meeting. 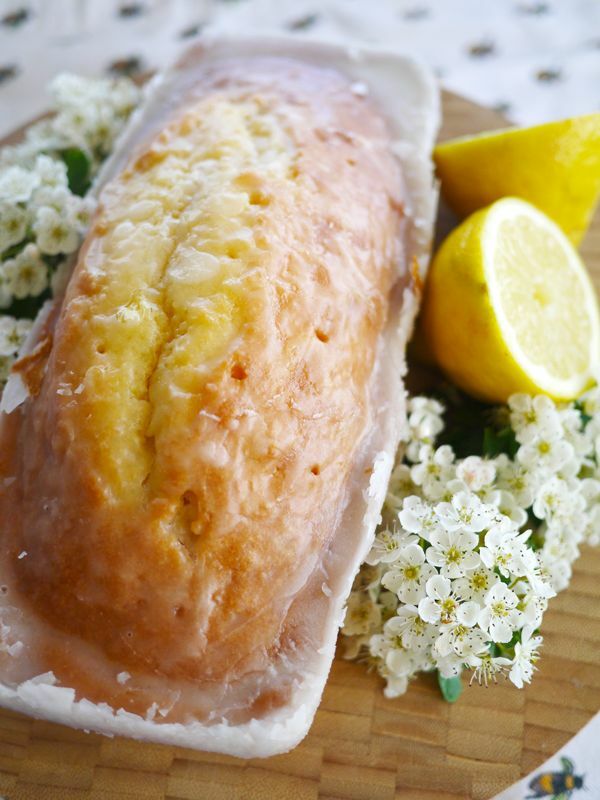 So at the end of last week I whipped up a lemon loaf, drizzled it in its lemony glaze & popped it into her office. Like bees on a honey pot, everyone lept on the cake and it quickly vanished into happy, chattering mouths. Everyone, without exception, agreed that proper lemon drizzle cake is far superior. Sorry Starbucks. I promised the recipe, so here it is! It’s effortlessly simple & absolutely ancient. Grease a bread tin (about 24 x 10.4) & pre-heat your oven to 180C/350F. & leave to cool. Personally I like to eat it when it’s still hot, but cold cake is much more civilised & easier to transport. Remove from it’s tin & slice into manageable hunks. Go on, lick that screen, you know you want to! Sugar, bleached enriched flour (wheat flour, niacin, reduced iron, thiamine mononitrate, riboflavin and folic acid), egg, unsalted butter (pasteurized cream), powdered sugar (sugar, cornstarch), water, lemon juice (lemon juice from concentrate (water, concentrated lemon juice), sodium benzoate, sodium metabisulfate and sodium sulfite (preservatives), lemon oil), vegetable shortening (palm and canola oil), emulsifier (propylene esters, mono-diglycerides, sodium stearoyl lactylate, tricalcium phosphate), nonfat milk, baking powder (sodium acid pyrophosphate, sodium bicarbonate, corn starch, monocalcium phosphate), food starch – modified, natural flavor, salt, icing base (dextrose, stearic acid, agar agar, salt, pectin, guar gum, sodium hexametaphosphate), corn syrup, natural butter flavor (maltodextrin, natural butter flavor, annatto and turmeric (for color)), vital wheat gluten, guar gum, xanthan gum, natural lemon oil, beta carotene wsp (maltodextrin, glucose syrup, gum arabic, vegetable oil, tocopherol, vitamin c, beta carotene pure, silicon dioxide), titanium dioxide, pan spray (soy lecithin, [contains one or more of the following: canola oil, palm oil, soybean oil, natural flavor, mineral oil]). What the frick is “natural butter flavour”? !